A few years ago, no one knew what chatbots were. Today it seems like every third website has a robot in the corner. That’s not a coincidence. Chatbots have proven to be an effective way to increase revenue in businesses of all sizes. The typical chatbot’s click-through rate ranges from 15-60%. The large range in click-through rate is because chatbots have many uses which, of course, affects the CTR. If you had a click-through rate from email marketing as high as 60% how would that affect your business? It makes you wonder, doesn’t it? This article looks at how chatbots are changing the digital landscape and a few use cases to increase your conversion rates while reducing your costs. A chatbot is a software program – which may or may not be powered by artificial intelligence – that can conduct conversations with human beings. This definition leaves a lot to be desired because many applications can conduct conversations but don’t qualify as chatbots. So where do you draw the line between app and chatbot? You can differentiate chatbots from other applications based on how interactions take place. A chatbot has a conversation sequentially. They talk and wait for your reply before continuing. Most applications don’t work like that. Another way to differentiate a chatbot from another application is the fact that it has an identity. You can build a chatbot and name it whatever you want and it’ll maintain that identity. For example, if you have sales and customer service chatbots, you could give each of them a different name. The sales chatbot could be Zig and the customer service chatbot could be zag. Anytime a user needs help in either channel, the correct bot would take over the conversation. 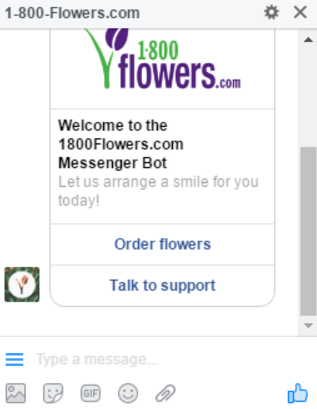 For example, 1-800Flowers.com named their chatbot GWYN. Each time someone has an interaction with the chatbot, they’re talking to GWYN. With each day that passes, people are discovering more benefits associated with chatbots. I’ll focus on the ones that have a direct and immediate business impact. A major challenge with sales is prospecting. You have to properly vet and qualify people. If you don’t, they won’t be a good candidate for your service and a lot of time will be spent without a return.Chatbots can step in and qualify visitors on your website by asking specific questions and appending tags to them depending on their answers. 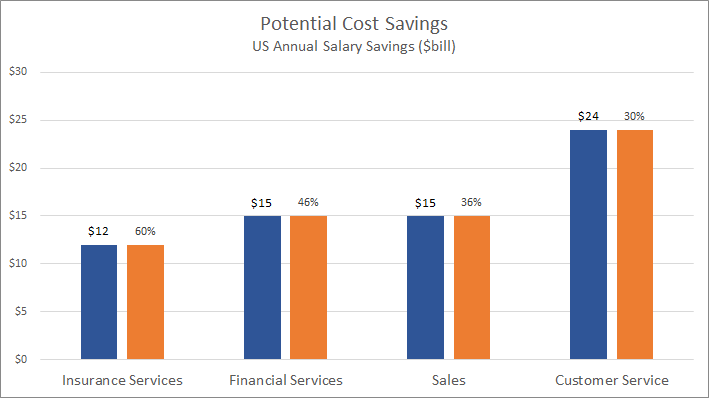 According to BI Intelligence, chatbots can save up to $39 billion a year in salaries across sales and customer support. Many people will visit your website, look around, and leave because they couldn’t find what they were looking for. A chatbot goes a long way towards bridging the gap between visitor and conversation.For example, if someone is on your services page and can’t find what they’re looking for, a chatbot makes it easy for them to ask. If the same question keeps coming up you know it’s something that needs to be answered on the page. Conversely, you could ask users if the page their on answered all of their questions. For example, someone is on the pricing page and your chatbot asks them whether pricing is clear. If they select the no option, the chatbot would continue by asking them to tell it what information they were looking for or whether the page was confusing. 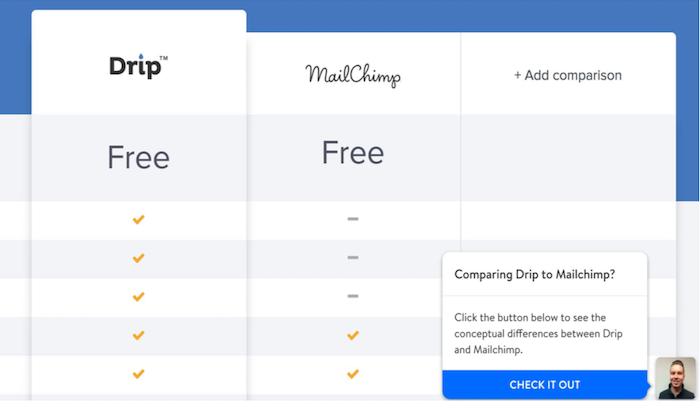 You can use that feedback to further optimize the pricing page. Now, let’s focus on three effective ways to use chatbots to increase conversions across the board. It can be daunting for customers to find what they need when you have a large collection of goods or complicated services. A chatbot is able to bridge this gap by asking questions about their wants and needs and segmenting them based on that information.Once segmented, it’s possible for the chatbot to show them specific products or packages from within the chat UI. This is what 1-800-FLOWERS.com did with their chatbot GWYN. As of June 2016, 70% of chatbot powered orders were from new customers. It’s not always possible to close a sale from within the chatbot interface. Sometimes, your visitors need a bit more information or a nudge in the right direction.With chatbots, you’re able to set welcome messages to find out what a visitor needs and proactively give it to them. Leadpages was able to use chatbots and human interactions to boost their conversion rates by 36%. They started off slowly with only live chat then moved on to automating a lot of the process to cut down on the strain their team was feeling. It’s important to note that they supplemented their chatbot usage with a human touch. 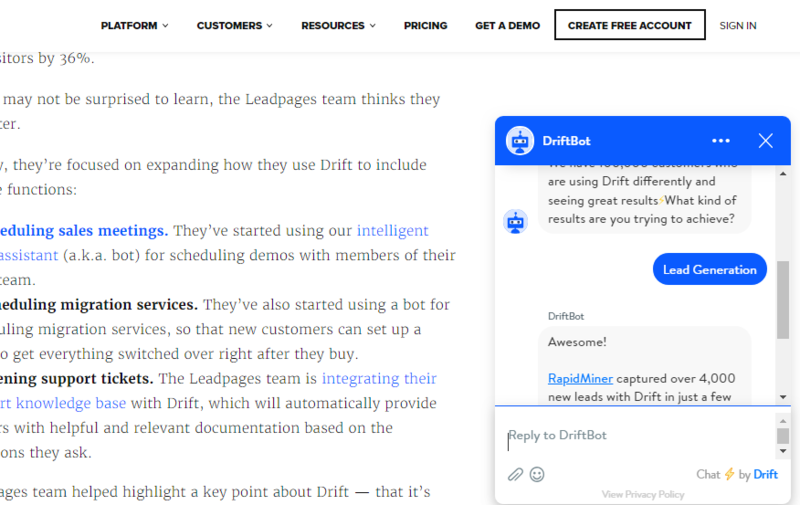 While I was reading the Leadpages case study, the drift chatbot popped up and did the exact same thing I’m describing here. After a bit of back and forth, it introduced me to the proper page. One of the most prevalent challenges for rapidly growing companies is maintaining a high level of customer service. It’s not easy to find, hire, and train reps.At the same time, the good ones are expensive. Chatbots are able to step in and serve customers for all but the most complicated issues. They can answer the questions directly or send people to the right resources. This creates a positive experience and keeps your current customers happy (and can encourage people to convert to customers). 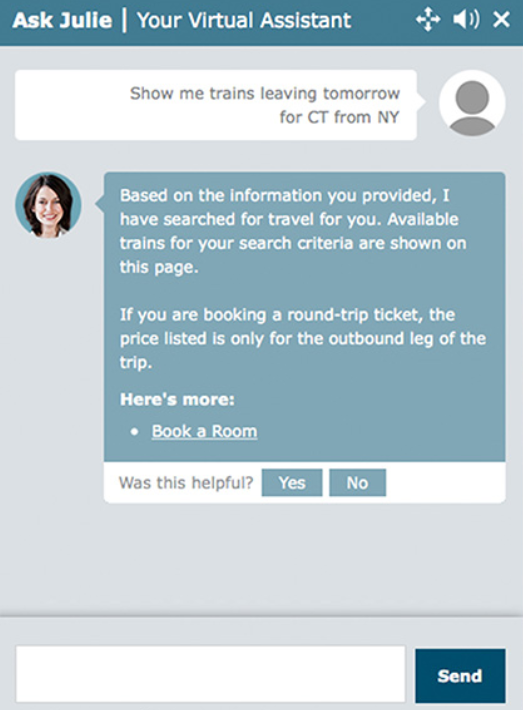 Amtrak used a chatbot named Julie to answer 5 million questions a year, save $1,000,000, and increase bookings by 30%. The bookings through the chatbot produced 30% more revenue. This is an outlier but it shows how effective chatbots can be for customer service. Chatbots, like it or not, are here to stay. Every day, they’re getting cheaper and smarter. Soon, the question won’t be whether or not you should get one but what’s the best way to use it. We’ve only scratched the surface of how you can use chatbots to increase conversion rates. You can either use them directly like 1-800Flowers and Amtrak did or you can utilize them as part of a larger initiative that combines chatbots with a human touch just like Leadpages did. Choose one and test it out for your business. When you start seeing results, add other methods and watch as your conversions continue to rise. 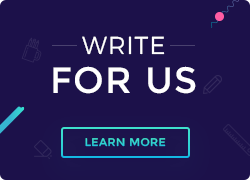 Daniel Ndukwu is the founder of KyLeads, a conversion optimization platform that helps entrepreneurs capture more leads with smart popups, quizzes, and surveys. Connect with him on Twitter at @daniel_ndukwu or Quora.